Besides Ann and Bob, the owners and operators of Evergreen Acres Christmas Tree Farm, LLC, you will meet many helpful people in the parking lot to direct you to your perfect tree and freshly made wreaths and greenery. Inside the heated barn you will encounter friendly and helpful people to assist you as you select your perfect freshly made decorations, help decorate a wreath of your choice in your specific color combinations and direct you to the complimentary cocoa and cider, restrooms or areas in the field to find your tree. 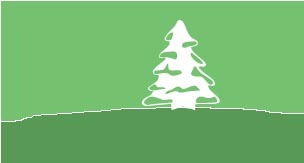 After you arrive at Evergreen Acres Christmas Tree Farm, LLC, you will find a friendly staff to help you decide on the type of tree you would like to cut and purchase. After you have found your tree and have it at the parking lot area, they will offer to shake and bale your tree for ease in transporting it and getting it into your home. We also offer help in loading your tree on or in your vehicle. Enjoy looking for your special family Christmas tree in our well mowed field. This makes your experience walking in nature much easier. It is good to think ahead and bring a sled to pull your tree in when there is snow, or a tarp on which to place your tree to pull it in if there is no snow. Both options make for an easier haul!